Plausible cartography resources apply real-world principles and models to world-building. The goal is to provide a setting which feels real and operates in a way that approaches “reality” – except where it does not. A great, free resource by Joseph Browning, released by Expeditious Retreat Press and available from Warehouse 23, Paizo, RPGNow, DriveThruRPG. 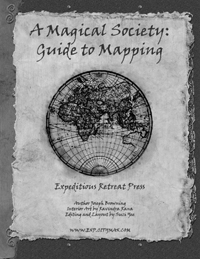 The Guide to Mapping is actually a 37-page excerpt of XRP’s much more expansive manual A Magical Society: Ecology and Culture. If you find the Guide to Mapping useful, you can pick up Ecology and Culture in PDF for $13. I haven’t yet purchased Ecology and Culture but it is on my list. This guide changed my approach to mapping. 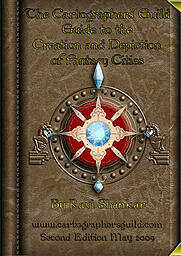 Ravi Shankar‘s guide to the Creation and Depiction of Fantasy Cities. A great description of how to approach the creation and layout of a Fantasy City. At 19 pages long it is an easy and inspiring read. In such a short space it covers everything from brainstorming the personality and major features of your city to how topography influences city design and street layout. Ravi made the file available for free. You can find it in PDF on the The Cartographer’s Guild and online. I wish he had expanded it. It is really good. If the Cartographer’s Guild stops hosting the file reach out to me and I’ll get it to you. Another one of the great resources you can find on The Cartographer’s Guild. The thread is a great discussion of how the flow of water on earth is influenced by terrain. User Elothan collated the material into a PDF which I’ve made available to you (Elothan shared the file via DropBox but that resource has disappeared). The resources listed here are the forums that I have most visited myself and found the most useful while creating my own world. If you are a Campaign Cartography 3+ user, you should already be familiar with the resources found on the ProFantasy Community Forum. In a lot of ways, the Community Forum is the friend you wish you had after you’ve already been through the help, the user manual, and the Tome of Ultimate Mapping and nothing has worked. There are a lot of great and helpful people on the Community Forum, including staff from ProFantasy themselves. An eclectic collection of topics on fantasy cartography and world-building. There is a tremendous amount of good material and resources on The Cartographer’s Guild if you are willing to dig for it. The Cartographer’s Guild community appears to skew towards the artistic side of fantasy map-making. Expect to find a lot of material produced with Adobe Photoshop and The Gimp. If you want to be inspired, however, you can’t go wrong with a visit to the Guild. Check out their Tutorials in PDF Format thread. The Worldbuilding StackExchange is a site I’ve spent a number of hours on exploring a variety of topics. Like a lot of interesting forums, it is very easy to get lost following one rabbit-trail or another. As of October 2017, the World-Building StackExchange has over 35,000 users and hosts over 65,000 answers to over 13,000 questions covering a range of topics. Interesting topics, interesting answers. The Worldbuilding Reddit. This one is on the list on the strength of its parent platform: Reddit. Unlike other materials here, I haven’t really explored it. I’m going to leave it here for now. I’ll provide more details after I’ve had more time to check it out. “World-Building Resources” page is up!